A sketch of the 84th Indiana Volunteers "C"
Hello, my name is Sharon Ogzewalla. 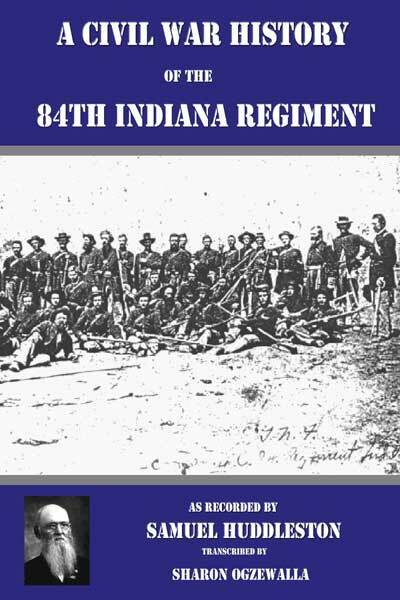 I have transcribed articles on the Indiana 84th Regiment from the New Castle Courier that was written by my Great Grandfather, Samuel Huddleston who was in this Regiment in Company "C" in 1871. These articles ran for an entire year in 1871. He was asked by the Courier if he would use his diary and prepare articles that were in effect a history of the 84th during the Civil War. It is very informative reading for those who want more information on what the 84th experienced during the Civil War. Who does not remember the days of 1862 when our country was shadowed by the cloud of war- the heaviest and darkest of the world's history? Bloody battles had been fought on hotly contested fields. Our arms had met victory here and disaster there. The rebellion still showed a strong and undaunted front and it was clear that a Grand Uprising of the North could only save our Country. Every man was needed in the ranks. The question of sacrifice was brought home to every house. Each family was called to give up its bravest and best. Marshalling drums were beating in once quiet and peaceful streets. Recruiting officers urged the claims of the country at every corner. Railroad trains were swarming with men crowding to the front. Cities were transformed into camping grounds where men were trained for battle. The question of private interests gave way before the stern necessities of the nation and all things were as dross when weighed in the balance with the safety of a great people. It was in such an hour as this that two thousand of the best men of the old 5th Congressional District left their happy and quiet homes- and all that was near and dear to them, gathered to "don the blue" in Camp Wayne, and took the solemn vows to God and the Country to give true allegiance, faithful service and life itself, if need be, to the cause of the Republic. Our recruiting officers were all at work, as they thought, enlisting men for the 69th; but this regiment was filled and organized and yet full companies and hosts of recruits came swarming into camp. On the 29th of August, a dispatch was received from Governor Morton, announcing the appointment of Nelson Trusler of Connersville, Colonel; Samuel Orr of Delaware County, Lieutenant Colonel; Andrew J. Neff of Winchester, Major; Lee Roy Woods of Centerville, Adjutant; Dr. Ziela Casterlline of Liberty, assistant Surgeon; and Wm. 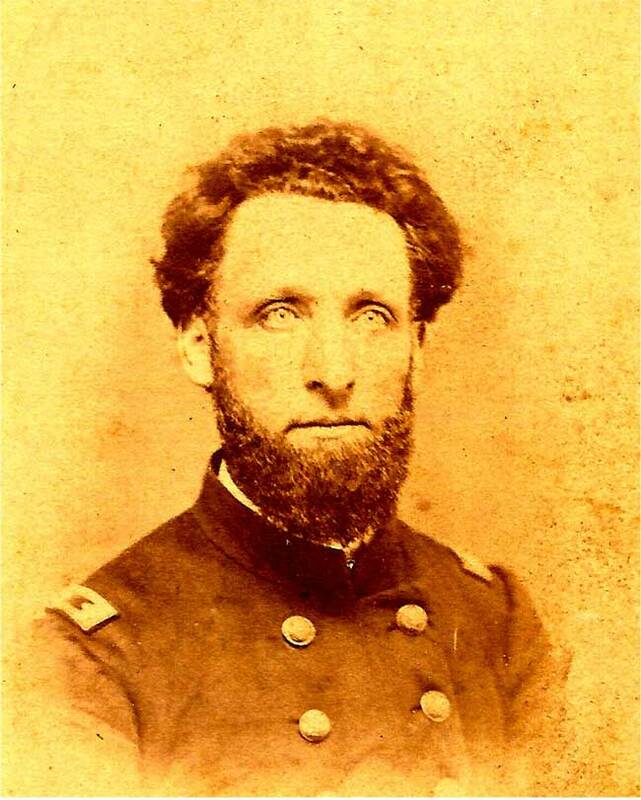 I. Jarrell of Liberty, Quartermaster, of the new 84th Regiment. On the same day the ninth company (Company "I") entered camp. The regiment numbered over nine hundred men and another company yet to come. The legs of the soldiers of the 84th were not used to tramping yet; but early on the morning of the 16th, the march was resumed, and kept up at a swinging pace until sunset, when the regiment entered Guyandotte and stacked arms on a lovely camping ground. Guyandotte is a small, sleepy town which lies at the mouth of the Guyandotte River, once beautiful but now ready to "fence in." In one of his letters Dr. Boyd speaks of it as follows: "This miserable rebel town wears the aspect of deep mourning. The few remaining inhabitants have the appearance of those who have just returned from an eighteen month funeral, at which all their relatives had been buried, and they returned to find their homes and firesides devastated by general ruin." Many of our men put in time in foraging. On the 18th, a party came in with large quantities of apples taken from a rich old rebel; and it was not unusual for our men to contract to kill and pack rebel hogs, taking the pork as payment for their services. A heavy detail was made from our camp on the 24th, to go to Catlettsburg- just across the line in Kentucky, at the mouth of the Big Sandy River. Reports were afloat that the Ohio was about to be blockaded by a rebel force at that point, and there was a prospect that the boys might see "smoke" before they returned. But those who remained were not without their share of excitement. In the afternoon, a rumor spread like a whirlwind in the almost deserted camp, that a rebel force, resting securely in the hills, only awaited night to attack the camp. An old citizen who came excitedly into camp reported that the enemy was within three miles of our pickets and would certainly attack us by sunset. Startled, our little remnant of fighting men looked after their cartridges and rifles. 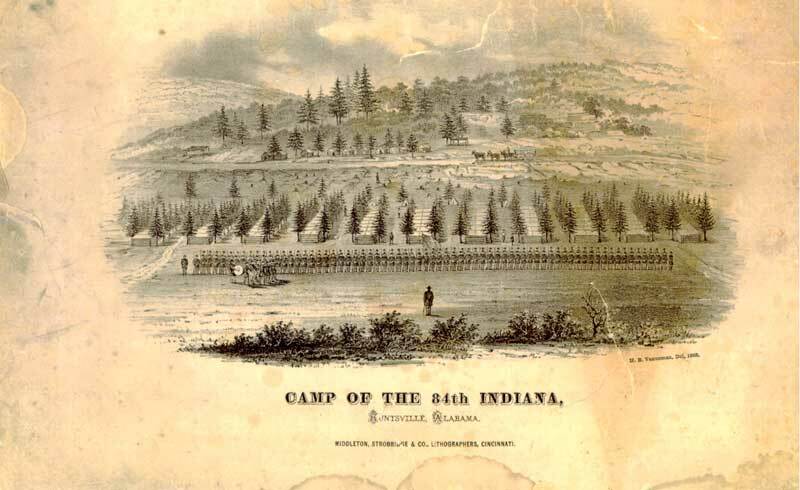 A council of the remaining officers of the 84th and 40th Ohio was called; but could not agree upon any plan for the safety of the camp. The men were at once put to work to fortify a position on the bank of the river, and a courier was also dispatched for the return of the scouts. The fortifications were completed and manned, awaiting the attack, when we heard the returning footsteps of the scouting party, which reached camp at one a.m. after a forced march of twelve miles. Immediately on their arrival, Colonel Cramor, our Brigade commander, ordered us across the Guyandotte River to a stronger position and sent our luggage across the Ohio. The long-looked-for but dreaded morning finally dawned; but no musket shot announced the approach of the enemy. The report was false and the Brigade, weary with watching and heavy labor, returned to quarters to rest. Companies "B" and "C", of the 84th, five companies of the 40th Ohio, and thirty well mounted cavalry men started, Oct 30th , to open communication with Charlestown via Barboursville and Hurricane Bridge. Evening found the troops snugly quartered in the town of Barboursville in a church and dwelling houses. The ladies there flew into the wildest rage at the presence of the hated "Yanks" and mingled tears and threats of vengeance; but their entreaties were lost on the officers. Next day, the command marched 18 miles and halted at Hurricane Bridge. The little village bore the marks of war. The bare chimneys- monuments standing over the ashes of once peaceful and happy homes- and the absence of all able bodied men told the sad story of a town which was one of the first to reap the bitter fruits of war. And this was only a sample of the towns among the Western Virginia hills. The infantry command remained in town under strict orders, while the cavalry scouted towards Charlestown. On the third day the cavalry reported; and on the fourth, the whole force returned to camp. The following picture of Sunday in camp is from a letter of Dr. Boyd: "This is Sunday. But not such a Sunday to the soldier as the civilian sees at home at his own fireside, surrounded by his family or accompanied by them to church. There, shut out from the cares of the busy world, to attend to his own devotional services. Sunday is letter writing day in camp. I have just taken a walk among the "boys" and found them in every conceivable attitude except standing on their heads, and all seem equally intent on the one object- endorsing an epistle to the dear ones at home. Tomorrow's mail will carry from the 84th more than one thousand letters conveying tender messages to soothe the anxious minds at home. Our Chaplain is now with us, and in order to make him useful as well as ornamental, we have him to go "down into Egypt" (over in Ohio) twice a week and solicit sanitary supplies for our sick in the hospital. Being a Methodist itinerant preacher, he is an excellent judge of yellow- limbed chickens and good things in general. Our excellent Governor manifested more than his usual amount of judgment in thus providing the 84th with a Chaplain whose various talents so amply fit him for acquitting himself honorable and with profit to the regiment. Our chaplain preached today his first sermon since he reached the field of action. He held forth in the Methodist church to a large congregation of blue uniforms intermingled with a very few pieces of calico from this almost deserted region. There were not as many civilians present as just men required to save ancient Sodom." Company "K", which had not yet joined the regiment, reached camp in the evening- creating quite an excitement. Our adjutant, Lee Roy Woods, received his resignation papers and quit camp, for civil life, on the 9th of November. 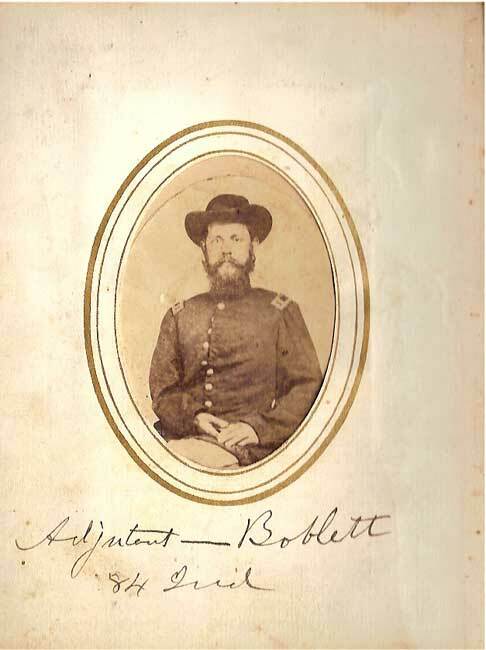 L. L. Boblett, private of Company "F", was at once commissioned to take his place. Lee Roy was a competent officer, but it was well understood that he was fully equaled in efficiency by the soldier from the ranks, for Boblett had long before proved his military skill as drill- master. 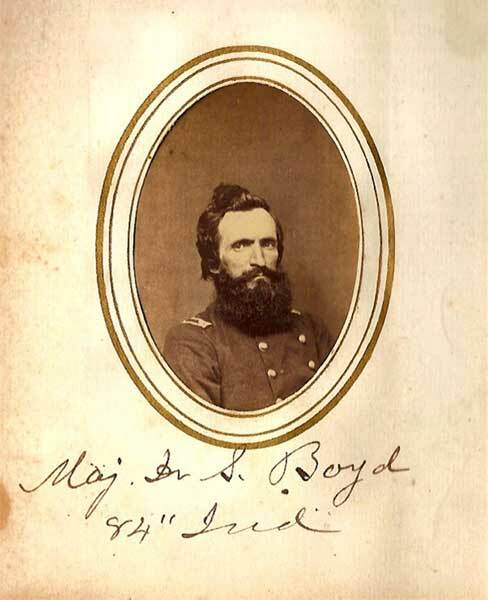 On the 14th, the Brigade struck tents and marched to Cattlettsburg, camping on the Virginia side of Big Sandy and Ohio rivers, near the town again; and we cannot do better than quote Dr. Boyd: "The town of Catlettsburg is an un-washed, semi-secession place of about four hundred inhabitants. Many of the citizens have a well-marked, antediluvian appearance in both habit and dress. At what exact time before the flood they found their place in the human race, is very difficult to determine. When we came here and took possession of the hotel for our hospital, the landlady paid her compliments to the writer by wishing him safely landed in that undiscovered "torrid clime" which it has been his life long desire to avoid. We have taken possession of the Court House also, to make room for the rapidly increasing sickness in our regiment. The hospital books show that eight hundred and sixty have been treated during the month of October. One hundred and forty-eight men were reported unfit for duty on the 30th of November. More than one hundred and twenty cases of measles and mumps have been treated." One of those painful accidents, not confined to camp life, occurred while the regiment lay at Cattlettsburg. Abram Life accidentally shot himself through the wrist so that amputation of his arm was necessary. Another rumor from a "reliable contraband" brought the enemy in large numbers to Guyandotte; and the soldiers primed their rifles for another conflict- in which the 84th won unfading laurels. The day passed quietly enough and the camp retired to rest as usual; but about eleven o'clock they were started by the sound of heavy picket firing on the outposts. The "long roll" was sounded; and in five minutes the 84th was in line and ready for action. Colonel Trusler being absent, Lieutenant Colonel Orr was in command. After getting the line fully organized for fight, he complimented the soldiers for their promptness and gave them permission to retire for the night. Doctor Boyd made the following report of the conflict. "The only serious accident that occurred was as follows: An unfortunate soldier hearing the order 'fall-in, promptly, boys, promptly,' sprang to his feet and, in a half-conscious state, groping his way in the dark tent, and perhaps having his mind somewhat confused by the peculiarity of the circumstance- in which condition he did not seem to observe the usual precaution; so, seizing his blue pants, which had by long service become very thin and fragile in parts, he raised his right foot and thoughtlessly plunged it into the pants, which, not taking the direction laid down in the "regulations," came out some two and a half feet higher and on the posterior region of the garment. The man, it is thought, will recover; but the pants are irreparably damaged." I now offer A Re ward fur one henry Ratcliff of 24 dollars the said Ratcliff broke gale on the 30th of Oct, 1862, A bout dusk. he is a About 6 hie & anyone A.Resten the said Ratcliff and delivering to me in Catilsburge shal have the Reward I havnt mentind he be longs to the 14 kentucky Redge ment oct the 31 1862 C.S. Guilkey jaler of boy County ky."